Pompey’s leading scorer Jamal Lowe can become a Premier League player in the future. That’s the view of team-mate Oli Hawkins after the former Hampton & Richmond winger delivered another dazzling performance in the Blues’ win over Rochdale. 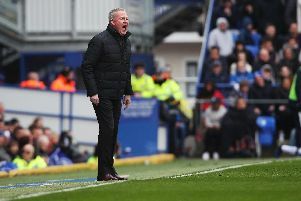 Lowe laid on two assists before rounding off the scoring as Kenny Jackett’s men romped to a 4-1 triumph, which moved fourth-placed Pompey to within two points of Barnsley, in second. That took the winger’s tally to 16 for the season in all competitions, while he’s also played a part in a further eight goals across the campaign. A brilliant start to the season saw the ex-Barnet man linked with a move to the Championship in January. But the Blues managed to retain him. Jamal Lowe adds a fourth for Pompey against Rochdale. Picture by Joe Pepler/Digital South. Forward Oli Hawkins got the opener against Dale after meeting Lowe’s cross on 21 minutes. The former Dagenham striker lauded the 23-year-old for the superb season he’s enjoying. And Hawkins has backed his Pompey team-mate to perform in the Premier League at some stage during his career. He said: ‘Jamal got two assists and a goal, it was a brilliant performance from him. ‘He can go on as high as he possibly can. ‘This is a step for him in the right direction and this season he is showing what he can do. ‘I think he could get to the Premier League, if he puts the work in. ‘Anything can happen in football and you never know. ‘Jamal has been brilliant for us this season. Front man Hawkins retained his place as the lone striker in Pompey’s win over Dale. That was a second successive start for the former non-league front man after being introduced as a substitute to net the winning penalty in the Blues’ Checkatrade Trophy final shootout win at Wembley last month. And Hawkins is just hoping to play his part, should he continue to be called upon in the race to reach the Championship. He added: ‘It’s always good to be back starting and doing as well as you can for the team.